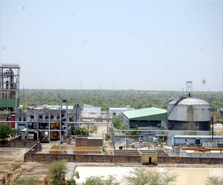 Agribiotech Industries limited has established a grain based Distillery in the year 2007 with a most modern state of the art technology, presently having capacity of 65 KLPD of Extra Neutral Alchohol / Rectified Spirits. The unit is located at 15 KM off the manin Delhi-Jaipur Highway near Shahpura at a distance of approx. 220 KM from Delhi and 70 KM from Jaipur. The unit is located at a total land area of 33 acres. The distillery being installed is a zero discharge unit meeting all the norms of Pollution Control Board, Ministry of Environment & Forest, Central Ground Water Authority etc. The technology as well as main plant and machinery has been supplied by Praj Industries Limited, Pune. ABIL is presently marketing alchohol in bulk to the reputed bottlers of indian made foreign liquor and country liquor to the canalise agency The shed constructed for grain storage has 30 days storage capacity, besides additional plinth storage of another 30 days has been provided for. The milling plant was supplied by world leader Buhler (India) Pvt. Ltd. on turnkey basis. The main hammer mill was imported from Buhler, Switzerland and other ancillary grain handling elevators, de-stoning etc., were supplied by Buhler (India) Pvt. Ltd., Bangalore.